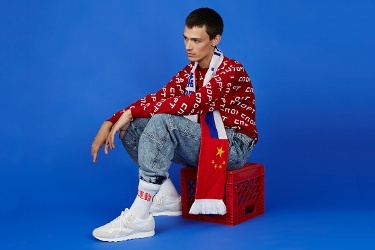 Dadier took Rubchinskiy's post-Soviet aesthetic and applied it to his own adolescent memories of mucking around outdoors. "I started by creating a small accord – which is a combination of raw materials – to illustrate the idea of when asphalt is burnt by the sun, but then you have a storm and it rains." The end result: a slightly offbeat unisex fragrance, appropriately summer-y. Yes, you will find the promised "accents of tar and rubber to connote skateboard wheels heating up on the pavement",3 but it's done with a light hand, and it reads as quirky rather than overwhelming. The rest of it is a green-inflected, rather dry, very casual summer cologne, citrusy in the opening and woody in the dry down, with light accents of herbal tea and vetiver. 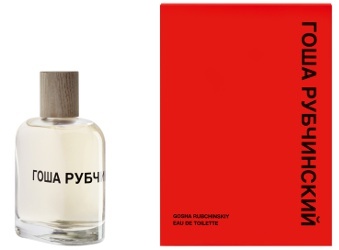 The red box presumably is a nod to Rubchinskiy's heritage, but the scent itself calls for the color of grasses, just as they turn from green to straw. Verdict: Fun, and like most summer fun, perhaps not quite so long-lived as one might wish. The particular set of notes lends it a feeling that is both outdoorsy and synthetic, and while it's easy to summon up a vision of skateboarding, it's an equally good fit with the asphalt on the playground, or perhaps some other manufactured nature experience from your own urban / suburban childhood. I classified it right away with Thierry Mugler Cologne, and later, Etat Libre d'Orange You or Someone Like You. Comme des Garçons + Gosha Rubchinskiy is available in 100 ml Eau de Toilette, $88. Other notes include angelica, buchu flower, mandarin seed, chamomile, styrax, vetiver and patchouli. For buying information, see the listing for Comme des Garçons under Perfume Houses. 1. Via "Gosha Rubchinskiy Bottles ‘Perfect Summer Weekend’", 9/22/2016 at Women's Wear Daily. 2. Via Fashion's avant-garde find scent irresistible at Financial Review. 3. Gosha Rubchinskiy Bottles ‘Perfect Summer Weekend’. I would characterize it as “a slightly offbeat department store fragrance.” I liked it better than william pharrell girl, but girl had way better packaging. Their hussein chalayan airborne was possibly in the same genre but much more interesting (as are chalayan’s clothes). Something in the opening of this one (plastic, barbie doll note?) brought to mind Nu_Be Oxygen but I didn’t compare them side by side. You liked Airborne better than I did, and I probably liked Girl better than you did — but none of them are more than slightly quirky, it’s true. Whereas I don’t know Chalayan OR Rubchinskiy from Adam — no prejudices at all. Had heard of Williams but don’t know that much about him either. But of all the “collaborations”, would say Monocle mag has done the best, followed by the first Stephen Jones. Until I read the notes, I thought thks sounded like Blvgari Black with the tea and. bakery bits removed. They don’t really have anything much in common other than the rubber part. I would definitely try this. For that price, I don’t need to care about the fashion! ???? CdG has mostly stuck to decent prices, and I do appreciate that — if only Stephen Jones had not insisted on that fancy hat bottle! Right??? I’d buy the first one in a heartbeat. It is a light and lovely summer fragrance. Nothing groundbreaking or unusual.. I thought of buying it, but I don’t want to spend money on a fragrance I have to reapply every 20 minutes to smell at all. Perhaps if it came in a huge bottle for the same price. I tried mine from a dab sample — hopefully it does much better when sprayed? And did not test it next to something like TM Cologne, maybe they are about the same, I don’t know. But it definitely wasn’t as bad as 20 minutes on me — I will buy something that lasts a few hours, but not 20 minutes.